Beautifully engraved certificate from the Saint Paul and Duluth Railroad Company issued in 1878. This historic document was printed by the American Bank Note Company and has an ornate border around it with a vignette of a train and 2 paddlewheeler steamships. This item is hand signed by the Company's President, and Secretary and is over 136 years old. The certificate was issued to and signed on the verso by the Trustee of Jay Cooke & Co, Edwin M. Lewis. The Saint Paul and Duluth Railroad was originally incorporated in 1863 and known as the Lake Superior and Mississippi Railroad. The road provided the first service between Duluth and the Twin Cities upon its completion in 1870. Serving as the all-important eastern terminus of the Northern Pacific Railroad, the road linked the Great Lakes and the Mississippi River. 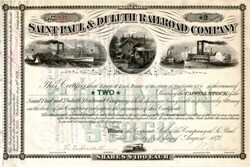 A victim of the panic of 1873, the company defaulted on its bonds and was reorganized in 1877 as the Saint Paul and Duluth Railroad. It was absorbed by the Northern Pacific in 1900. During 1870, Jay Cooke & Co. became heavily involved in financing the Northern Pacific Railroad. Jay Cooke also committed personal finances. Difficult economic times, overextension of the firm, and the company's complex ties to the Northern Pacific Railroad brought the downfall of Jay Cooke & Co. in the autumn of 1873. Cooke's business failure played a significant role in the Panic of 1873. Cooke made many efforts to shore up his banking houses and try to settle with his investors without going bankrupt, but bankruptcy was declared November 26, 1870. The courts appointed Edwin M. Lewis trustee for Jay Cooke & Co., and he worked with Cooke to settle with all the creditors. The final settlement of the bankruptcy was not completed until 1890.